Get NSPICEAC here (nspiceac.zip 280K). NSPICEAC is a version of NSPICE only fit for AC analysis of (simple) circuits. It demonstrates the main features of NSPICE, among them production-quality graphics and printing. All of Forth's power can be used in entering circuit descriptions. Power supply design for gas-discharge lamps is a notoriously difficult area because of the very wide range of time constants involved (mains: 20ms, rectifier-smoother: 200ms, switches 10us - 200ns, lamp 30ms - 10min). The idea is that we can gain simulation speed by trading in generality for simplicity. Speed is enormously important for the considered applications, as is uniform convergence. A breakthrough is needed to enable Monte Carlo or DOE (Design Of Experiments) techniques to be applied in this area. However, with fixed timesteps it is necessary to synchronize switch transitions with timesteps, to prevent excessive error as described in, e.g., "Behavior-Mode Simulation of Power Electronic Circuits", H. Jin, IEEE Transactions on Power Electronics, Vol 12, no 3, May 1997 . There is a problem when the current through a switch reverses. This is a process that by definition can't be synchronized. It is obvious that in essence this is equivalent to the sampling problem in digital filters with feedback. The problem can be reduced by reducing the timestep, but smarter, i.e less costly, algorithms might be possible. Note that resonant circuits normally don't have this problem (all discontinuities in voltages and currents appear at the switching instants), but DC-DC converters with a discontinuous mode cycle-part do suffer (as do power-feedback circuits). The most popular remedy found in literature is interpolating all state variables back to the point where a current zero-crossing appears and restart from that point in time. This effectively "pretends" that the next timestep appears at the zero-crossing exactly, and prevents accumulating non-linear error at the cost of a small discontinuity on the time-axis. I have implemented this in the current release of NSPICE, but the effect is (disappointingly) minor. NSPICE uses modified nodal analysis and thus needs constant, time-independent system matrices. 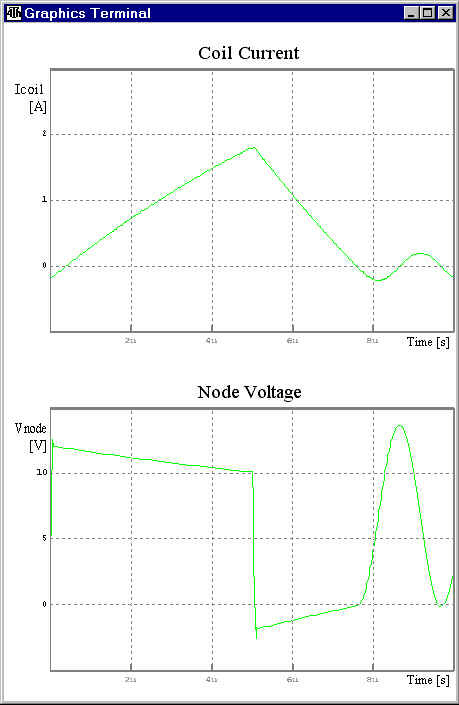 Simulating power electronic circuits is made possible by use of the switching-function concept (Jin). The use of switching functions transforms switched networks into a set of dependent sources (typically 2 sources per switch). The source control voltage is a function of the original switch gate turn-on/off signal. For the basic DC-DC converters the switching functions are trivial and could be made available as standard building blocks. There are pros and cons to the switching-function concept. On the basis of this analysis Trapezoidal Integration should be the best choice (fastest). The disadvantage of the trapezium rule is that a DC-analysis is needed before the start of a transient analysis (both Vprev and Iprev of L's and C's must be known). The enormous difference in fundamental timeconstants of a typical off-line converter, see above, leads to a set of "stiff" ordinary differential equations (ODE). Stiffness is the effect that inaccurate solving of, in principle, uninteresting HF-solutions of an ODE leads to low-frequency results that are completely wrong. The idea here is to physically separate the ODEs in fast and slow parts. This is in practice quite natural because they are generated in distinct parts of the converter anyway. A general and elegant solving method would be to simulate the circuit parts in communicating parallel processes or threads. For a 100 kHz halfbridge on a 50 Hz mains, the tank equations are periodically solved 2,000 times per mains period (typically using 100 steps per HF-cycle). This is clearly excessive. Intuitively (sampling theorem) one would expect that a minimum of 100 full evaluations per second (2 per mains period) suffice. This is not realistic given the current SOA (1997). But even 100 evaluations per mains cycle will reduce computation time by a factor of 20. The method will work best when Tlf is an integer multiple of FCI. This is no limitation. At step 2. the new HF source values will cause the impulse response of the HF part to be triggered. This is potentially a lowly damped oscillation. We can simply compute n FCI cycles, where n > 1, and only keep the last step. This can be automated, however, when n > Tlf/FCI there is no gain in our new method. Methods exist to compute the PSS in a single step, we may use them in the future. Finally, some (current-mode) circuits do not have a constant FCI, it varies during the simulation. This is not important for the method explained above. The implementation in NSPICE is such that this is not a problem for the simulator anymore. Note that the described method is related to state-space averaged modeling. However, we don't require the user to derive switch and converter models analytically, the simulator does this numerically, on-the-fly. Moreover, this technique doesn't require low ripple, a periodical steady state is all that is required. Also, contrary to SSA we get HF detail and LF response at the same time while current-mode control and discontinuous mode aren't problematic (when the proper switch models are being used). Above I stated: `The idea is to simulate the "fast part" accurately with a small step'. Actually, this is quite a problem because errors in the FCI get at least multiplied by RATE-MAX (to first order approximation). This means that for a global error < 0.1%, assuming RATE-MAX <= 1000, we need a basic accuracy of 1e-6 over the FCI. Because we use trapezoidal integration (error proportional to h^3) we need h on the order FCI/1e2, assuming 100% error for h = FCI. (In practice it is easy to find signals that have much larger errors--a diode switching off at the start of the FCI, etc.). For a basic accuracy of 1% and well behave signals we still need on the order of 50 steps on the FCI. Therefore, for future releases, it might be needed to complicate matters and go back to variable, quality-controlled, timesteps. Not all bad, as this automatically solves the "unsynchronized event problem" (diodes turning on or off between timesteps). Hopefully the increased overhead per step is compensated by the fact that larger steps can be taken. The fact that it is very difficult to beat SPICE for non-stiff SMPS circuits is encouraging here. A "problem" with variable timestep, aka non-constant system matrix, is that ALL states must be stored in the system matrix. Implementation of e.g. a flip-flop or averager using local variables is out of the question. We may have to go to variable timesteps (and thus setting up and solving a new system matrix once each timestep). The alternative is to redo the FCI with a smaller Thf. The results should be identical within some error bound. If not, decrease Thf and restart the FCI computation. This is a much less costly extension because a new system matrix must be set up and solved, only twice per FCI (not once per timestep). Because of our definition of FCI, all FCIs are equal so the Thf is constant during the simulation once the optimal value has been found. It is always possible to do a simulation twice and compare the results to see if it has to be redone with smaller Thf (a prudent user will do this anyway). This is certainly more efficient than the dynamic step method for a single simulation, and it is much, much more efficient for Monte Carlo analysis. However, there might be circuits for which the needed Thf is so small that the variable time step method would have been more efficient after all. This can only be found experimentally. Unless we have a "special" circuit at hand, it seems the main benefit of this extension is with naive users, or when it is considered "unprofessional" to have the user explicitly check the validity of the results. This is not our target audience; and so we won't implement this extension A (not now anyway :). Check if the state variables changed "negligeably" after computing an FCI. (This is stricter, and, amazingly, easier to compute, than checking if they're independent of Thf). If they don't, compute another FCI until they do, else skip to the next LF point. This checks that the "FCI" is indeed cyclical, i.e that there are no relatively "fast" dynamics. This doesn't guarantee correct results when the Tlf is chosen too large (Ext. C). It looks to me that this strategy prevents accumulating large errors when making a Tlf step excites the impulse response of the HF part. This seems like a very useful addition (a formal PSS solver would be better). Check if the averaged state variables depend on the value of Tlf. If they do, decrease Tlf and restart. See also Extension A: this isn't useful when we can (and should) redo the complete simulation. The alternative is to check if the averaged state variables change "too much" and issue a WARNING when true (this is too strict because it will warn for perfectly valid transients as well). Beacuse of the implementation, decreasing Tlf means that the system matrix must be recomputed and solved again. Therefore, once Extension C is done there is no reason to not implement Extension A (alternative part). In practice it is not necessary to laboriously calculate average values at the FAST <==> SLOW ports. The effect of Tstep on the fast and slow circuit matrices is concentrated in the C, L elements: h/C and h/L terms. A larger Tstep is clearly equivalent with smaller C and L values. Thus it is sufficient to use Tlf/Thf times down-scaled L and C values in the slow part, computing both parts at once with the same (small) Thf. It remains to detect the boundaries of the HF PSS (trivial in a fixed frequency circuit) and to discontinuously advance time to the next (Tlf) point. At the time of writing, Jan 17, 1998, I have worked with NSPICETR intensively over a period of 3 months. The simulation speed is very high: 33 - 100 times faster than SPICE on realistic circuits. Personally I like the input method better than SPICE's. In the future I will want a schematic drawing of the netlist, but for small projects it is no problem yet. The flexibility of NSPICE's ASCII input for procedures, macros and simulation specification has no match in SPICE, I doubt if I'll ever consider adding schematic entry. The NSPICE post-processor, although spartan, does most of what I need and allows high quality display, clipboarding and printing. For big jobs INTUSCOPE is used as an additional post-processor, working as a background task in a separate window. The extensions listed above don't seem to matter much, for the practical circuits tried up to now. The visual feedback from the simulator immediately points out wrongly assigned FCI or RATE constants, and the user can almost instantly correct this. Specifically, I do not believe that having perfect state-event signalling/handling, or higher-order multistep integration (with non-constant state matrix) will bring much for SMPS simulation (simulating switched capacitor filters would be an entirely different kettle of fish). NSPICE speed can be increased for special problems. I now keep Tlf constant, but could design some sort of "quality-controlled" Tlf stepper. The system matrix must be recomputed if Tlf changes, on the other hand the positive effect is high when analyzing, e.g., the impulse response of a SMPS. The VRES component implementation has already shown how to handle a "database" of system matrices, so this might be an easy job. CIRCUIT -- required at top of file. No END needed. TRUE | FALSE TO ERASE? TRUE | FALSE TO RMS? .INFO .REPORT .STATIC .SOLUTION .DUMPS" filename"